Loison bakery grants three generations of people able to constantly challenge themselves to keep up with the times and with food trends. Born as a small wood-oven bakery, through 75 years, the small workshop of Costabissara has become a well-established company whose production is in demand all over the world. In 1938, when Tranquillo Loison opened his small bread bakery in Costabissara , close to Vicenza, Italy, bread was a staple food for the majority of the population. However, the introduction of ration cards during World War II limited its distribution and consumption. The end of the war and the improvement of the economy led to an increase in the demand for sweeter and tastier products. That is when Tranquillo began producing focacce with figs and raisins. His son Alessandro soon expanded the range of products adding spreads, wedding cakes and fresh pastries that he would deliver personally to local coffee shops and families. In 1955, Alessandro began specializing in the production and sales of Panettone and Pandoro cakes, yielding about 20-30 kilos a day. This new activity, together with the pastry line, was immediately much more profitable than selling bread alone, a product that was discontinued in 1960. In 1992, Alessandro’s son Dario joined and eventually took over the company contributing to its international expansion as a symbol of what’s ‘Made in Italy’. Loison has its own Museum and Library featuring a collection of historical postcards, antique confectionery items and books on the history of bread baking and pastry. A place where to breathe and promote culture. Dario Loison at times undertakes the role of university professor and gives lectures on entrepreneurship at Italian universities. Loison hosts groups of students who visit our company for a day to understand how and where ideas are born. This year I tried the Panettone Limoni, naturally leavened, typically shaped where the surface is cutted with a typical cross cut. The yellow dough is eniriched with Sultana raisin, candied lemon peels and filled with delicious lemon cream. The other I tried is the Cherry Panettone (with red cherries) A beautiful and sensual panettone well leavened and literally filled with lightly sugared cherries taht pair greatly with te sweetness of the dough. Aromas, taste and aromas are those of a very good and artfully made industrial panettone, with pleasant toasted notes of butter, candied fruit and vanilla making a contained sweetness enhanced by the generous quantity of fruit. This cake got the attention of food blogger Federica Cegalin. The boy was secretly in love with Adalgisa, daughter of Toni, the most popular baker in Milan. To spend more time with her, Ugo managed to become a pastry cook apprentice. Christmas was coming, and Ugo wanted to give a twist to the usual bread.He sweetened up the dough, adding sugar, butter, eggs, raisins and chopped candied fruits, then he cooked and shaped it like a giant muffin. The novelty instantly became the talk of the town. Everybody wanted the new Toni’s bread (pan de Toni) soon named panettone. In 1930, two well-known patisserie masters, Mr. Agostino Panigada and Mr. Giovanni Cova came together to create their first workshop in Viale Nurzia in Milan. Here the real “Panetun di Milan” was born. Traditional Panettone generously filled with raisins and candied fruit peel (including a lot of squared oranges that I love) The “Milanese” pound (Libbra) is an ancient unit of measurement of Northern Italy – it corresponds to 1120 grams. Breramilano. have adopted this peculiarity to highlight the prestigious “Milano” line, where the combination between taste and art reaches the most impressive outcome. This line, called BreraMilano1930 (now widely distributed in the US) is characterized by making use of a special paper, rough to the touch, that takes its stylistic inspiration from their original 1930s collections. Breramilano produces superior quality confections particularly their Panettone and Pandoro which are known as the undoubted symbols of Milanese confectionary art all over the world. For this company, remembering and respecting the past means keeping alive the ancient confectionary art traditions, respecting old recipes and checking every single ingredient for quality. Their aim is to keep alive the flavors of the past as time goes by. 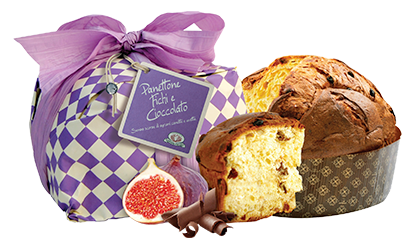 On the occasion of the upcoming holiday season Fraccaro Panettone al Radicchio Rosso di Treviso IGP. This cake is made with traditional recipes, sourdough, enriched with that delicious red chicory typical of the Treviso territory. The ingredients are few and simple, but the balance of the manufacturing processes is complex and delicate. The typical bitter taste, is rendered less intense from seeds candied process that transforms this “winter flower” to a perfect cake to be combined with the soft dough. The careful selection of raw materials and of the Veneto region, the creation of flavors and forms, the experience of people who paste and firing, make this panettone really unique, as well as unusual. a line of products designed for anybody looking for quality, for those loves nature and do not want to give up the pleasure of patisserie. produced by Mezzolombardo, the legendary company near in the province of Trento. This blend of authentic, top quality products has given rise to a delicately spongy panettone with a creamy grappa filling with a warming, intriguing flavour. both in the dough and the filling. Meet Diana Zerilli, promoter, food events creator and wine connoisseur. Among his biggest hits, Eatingfrienship & Wines, tasting of Tuscan wines of Mormoraia Bocale held in Hong Kong in 2014. Specialist in relations between the producers of Italian wine, olive oil and homemade pasta with foreing markets including New York, Hong Kong, Tokyo, Shanghai, London, among others. entirely made through a text messages collection. Diana just released a new book out called “21 grammi” a collection of dishes that combine food to selected Tuscany wines. For the Holidays, Diana created one of a kind Vernaccia Panettone, the traditional Christmas cake, enriched by a generous quantity of raisins that have been macerated in the S.Giminiano Mormoraia Vernaccia white wine, to enhance the cake fragrance. located inside the Barclays Teatro Nazionale in Milan.